‘Eminent biologist hits back at the creationists who “hijacked” his theory for their own ends’. So says the headline of an article by Steve Connor, Science Editor in The Independent (UK), April 9, 2002, referring to the imminent release of Professor Stephen Jay Gould’s new book, a 1,400 page treatise called The Structure of Evolutionary Theory.1 Gould is a high-profile professor of zoology from Harvard University, well-known for promoting the controversial view that the fossil record contradicts the slow-and-gradual transformation idea of classical Darwinism. More recently, he has become more famous for revealing Darwin’s Real Message, but at the same time trying to pacify ‘religious’ people by asserting that religion and science have ‘non-overlapping magisteria’ (NOMA).2 The following quotes are from Connor’s article. I guess we’re ‘guilty as charged’ on this one. It seems that Gould would have it that only evolutionists be permitted to use the arguments of evolutionists. Only those ‘in the club’ can legitimately discuss these things, it would appear. Gould and Niles Eldredge, a former student of Gould, actually faced up to the fossil record and decided it did not support the gradualist dogma.4 They argued strongly against some of the classical claims of gradual transformation. In doing this they were inadvertently agreeing with creationists. Naturally, creationists used their admissions. It would be difficult to find franker admissions to the lack of evidence for gradual transitions in the fossil record. Now it is a powerful and legitimate debating tactic, employed by all, to use the admissions of ‘hostile witnesses’. Clearly, Gould is not a creationist and has no sympathies whatsoever with us. He appeared on behalf of the evolutionary thought police, the ACLU (which incongruously contains the word ‘liberties’ in its title), at the 1981 trial over the teaching of origins in schools in Arkansas. Both he and Eldredge have used quite intemperate, insulting language in referring to creationists, especially since 1981. See a refutation of Eldredge’s latest anti-creationist foray. We make no apology for using the admissions of evolutionists about the true nature of the fossil record. Other evolutionists have also admitted the problems. See, for example, Are there any Transitional Fossils? Of course Gould and Eldredge are wedded to materialist philosophy (and self-servingly make this a defining characteristic of ‘science’—see The rules of the game), so the data cannot for them mean that evolution did not occur. It’s ‘a fact’. They reasoned that evolution must have happened in such a way that transitional fossils are absent or very rare. They proposed that the changes must have occurred in small populations and relatively rapidly. The latter has to be understood in terms of the supposed mega-years of the evolutionary view—that is, the changes occurred over thousands of years, which, compared to the hundreds of millions of years of the fossil record, is a ‘rapid’ change. This new theory supposedly accounted for the origin of new species; it was claimed to not be about the origin of radically different body plans (such as phyla). Nevertheless, if PE and its proposed mechanisms are an accurate description of the basic mode of operation of evolution, as Eldredge and Gould originally argued, then it must also account for the origin of basic body plans, because evolution supposedly accounts for all the variation in living things. However, on several occasions Gould has suggested that some basically different mechanism must operate to account for fundamentally different body plans. In this regard Gould spoke favourably of the ideas of Richard Goldschmidt,7 a German palaeontologist from the mid-1900s who also faced up to the lack of transitional fossils, and listed a number of complex structures that couldn’t have been built by small advantageous steps. Goldschmidt agonized over the big picture of the fossil record—where the major categories of living things, the phyla, appear fully formed, without any evidence of a graded series of transitions from some common ancestor of all. Goldschmidt proposed a ‘hopeful monster’ theory, where the major body plans were seen as arising suddenly, by some sort of macromutation. This was popularly portrayed as being like a bird emerging out of a reptile egg—a ‘hopeful monster’ theory. However, I know of no mainstream creationists deliberately misquoting his work; that is something else. Evolutionists often make these sweeping claims, without substantiation. For a detailed review of Gould and Eldredge’s PE, and how it has fared, see ‘Punctuated Equilibrium: Come of Age?’, originally published in TJ (the in-depth journal of Creation). This will demonstrate to any fair-minded reader that we have not misconstrued or deliberately misquoted Gould’s work. ‘"I had no premonition about the hubbub that punctuated equilibrium would generate," Professor Gould said. Some "absurdly-hyped popular accounts" proclaimed the death of Darwinism, with punctuated equilibrium as the primary assassin, he says. “Thus, we stood falsely accused by some colleagues both for dishonestly exaggerating our theory to proclaim the death of Darwin (presumably for our own cynical quest for fame), and for unwittingly fostering the scourge of creationism as well,” he said. Perhaps this explains the vitriolic denunciations of creationists since the 1981 Arkansas trial—Gould endeavouring to close ranks with other materialists, to repair the breach, to prove that he is just as caustic in his criticism of creationists as any of his colleagues in a competition to be ‘more anti-creationist than thou’. There is nothing like a common enemy to bring solidarity. Also, Ernst Mayr, whom Gould critiqued as a representative of gradualism, dismissed Gould’s ideas as merely a variant of his own theory of allopatric speciation (i.e. geographical isolation leading to reproductive isolation). This is especially significant because Ruse had also testified with the ACLU in the same trial as Gould, and at that time dismissed the idea that evolution was religion. Consequently, Darwinism will not die while ever there are atheists wanting to be ‘intellectually respectable’. Darwinism / evolution has come to mean simply ‘naturalistic (that is, Creator-less) origins theory’. Since in the minds of Dawkins, Gould and co. there is no Creator in the real world, then ‘evolution’ (naturalism) is a fact. Gould and Eldredge provided an escape route from the evidence against the normal gradualist concept of evolution—PE. As they said in their 1993 review, they gave ‘theoretical space’ to stasis and abrupt appearance. Long argued by creationists as evidence against evolution, stasis and abrupt appearance now became the evidence for evolution by PE! So how can evolution be refuted in the minds of its proponents? It can’t. If a series of fossils showing transformation can be found,13then this is claimed as evidence for ‘evolution’ (gradualism), but if such cannot be found, then this is also claimed as evidence for ‘evolution’ (PE). ‘Heads we [evolutionists] win; tails you [creationists] lose’! Gould’s writings have encouraged many creationists. It’s nice that stasis and abrupt appearance, the actual data of the fossils, have been given ‘theoretical space’ by a prominent evolutionist. If it were not for the growth of the modern creation movement, many other evolutionists might have joined with Gould and Eldredge in facing up to the data. Initially some did, such as Vrba and Stanley. That’s much less likely since 1981. Darwinian fundamentalists like Dawkins (a non-paleontologist) continue to refuse to allow the fossil evidence to speak. As a biologist, Dawkins made his reputation on just-so story-telling for the slow-and-gradual neo-Darwinian myth. He probably also realizes that the information problem in living things is difficult enough to solve in neo-Darwinism, but it would be impossible with PE, so he fights the fossil experts such as Gould who would rock the boat (see also this critique of Dawkins’ attempt to solve the information problem). It seems that the real data of the fossils has once again been pushed into the background. It just fits the Creation / Flood teaching of the Bible too well. Connor, S., Eminent biologist hits back at the creationists who ‘hijacked’ his theory for their own ends, The Independent, 9 April 2002; Web version last accessed 18 April 2002. Return to text. Gould provides nothing original in this idea—18th century ‘Enlightenment’ philosophers such as Immanuel Kant and Jean-Jacques Rousseau argued that religion and science were two separate domains that must be kept apart. Return to text. Dawkins actually occupies the Charles Simonyi Chair of Public Understanding of Science, but he uses his position not to promote understanding of real operational science at all, such as physics or chemistry, but instead to flagrantly promote atheism. See also critiques of Dawkins at Countering critics’ attacks on creationist ‘design’ arguments. Return to text. Eldredge, N. and Gould, S.J., Punctuated equilibria: an alternative to phyletic gradualism. In: Models in Paleobiology, T.J.M. Schopf (ed. ), Freeman, Cooper and Co., San Francisco, pp. 82–115, 1972. Return to text. Gould, S.J., Evolution’ erratic pace. Natural History 86(5):14, 1977. Return to text. Gould, S.J., Is a new and general theory of evolution emerging? Paleobiology 6:119–130 (p.127), 1980. Return to text. For example, Gould, S.J., The return of hopeful monsters. Natural History 86(6):22–30, 1977. Return to text. Gould, S.J., and Eldredge, N., Punctuated equilibrium comes of age. Nature 366:223–227, 1993. Return to text. Levinton, J., Scientific correspondence. 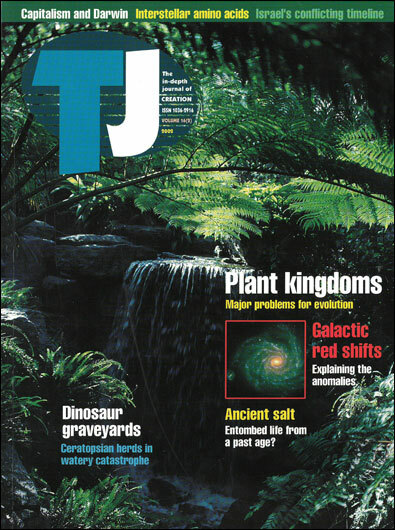 Nature 368:407, 1994. Return to text. On this point alone it is strange indeed that various bishops in the Anglican Church in England have sided with the atheist Dawkins in advocating the teaching of evolution only to children in schools in the U.K. Do these bishops want the education system to turn out atheists? Return to text. Popper, K., Unended Quest p.151, 1976 (Fontana, Collins, Glasgow). Return to text. Michael Ruse, professor of philosophy and zoology at the University of Guelph, Canada (National Post, May 13, 2000, pp. B1,B3,B7). Return to text. Some transitional series of fossils are expected in creationist thinking, as animals and plants adapt to different environments in the post-Flood world, but the transformations seen will be limited to within the created kind, or ‘baramin’, e.g. horses. Transformations between major categories in design will not be found. Return to text.